Since practically the dawn of time, animals and humans have coexisted in some fabulously symbiotic ways. In fact, National Geographic reports that many scientists believe dogs were the earliest domesticated animal, a process that took place between 20,000 and 15,000 years ago! After that point, animal domestication has evolved for so many species and for so many purposes. Livestock were domesticated for food, horses for transportation—even cats were brought aboard ships to rid the confines of disease-infested rats. Our relationship with animals is about as amazing as animals themselves. There are so many moments throughout history where pets and service animals have gone above and beyond what might have seemed possible. These pets are truly lifesavers, and are wholly deserving of a trip to Royal Pets Market & Resort. Even if your pet just looks astonishingly cute as their superpower, they still are deserving of a trip to Royal Pets Market in Tampa or St. Petersburg as well. Read on to learn about some life-saving pets, and take a trip to Royal Pets Market & Resort! Buster, the most decorated military dog in history, completed five tours in Afghanistan with the RAF in Britain. 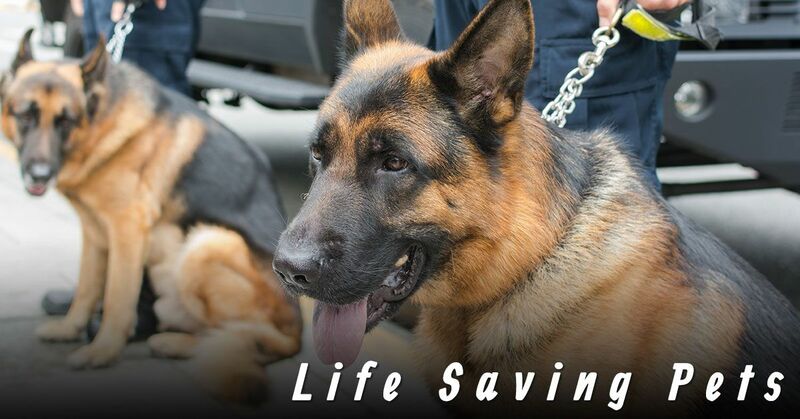 Buster is credited with saving over 1,000 lives due to his bomb prevention actions. As a reward for his finds (such as grenades or other live ammunition), Buster would get to play with a tennis ball—military dogs are not actually trained to be rewarded with food. Buster is a springer spaniel. An Alsatian by the name of Irma was a search-and-rescue dog who served during WWII. As aerial bombings caused ghastly amounts of damage and civilian harm, search-and-rescue dogs were vital to helping civilians during WWII. Irma refused to leave a site full of debris for a full day, insistent that there was human life present. Over a day later, two young girls were pulled from the wreckage, and they were still alive. Irma went onto save hundreds of lives. Another life-saving dog during WWII known as Rip ended up rescuing an incredible number of people. Rip was actually a stray dog with a knack for human rescue, and in just 12 months alone, Rip rescued over 100 people. He continued to serve and help throughout the remainder of the war. Our flying, feathered friends might seem fairly docile, but many instances throughout history have shown that messing with a bird and their humans is a bad idea. Like so many other pets, birds show just as much potential for having your back. The intellect of birds was something that only more recently began to be researched, but many birds have been revered as intelligent for centuries. Back in 2014, Dylan the cockatiel saved his Indiana owner from a house fire. Andrew Hardiek said he was sleeping when his beloved bird woke him up to smoke filling the house. Dylan began to squawk before the fire alarm sounded, alerting Hardiek to the impending house fire. Hardiek had the right idea for thanking Dylan, telling reporters he planned to take him to the pet store to show his gratitude. When a woman in Great Britain took her African grey parrot Wunsy to the park in 2014, a seemingly ordinarily quaint outing was about to take place. Instead, the 25-year-old woman was grabbed by an assailant, a man who pushed her to the ground. Wunsy was having no part of this, however, and began to attack the man with great vehemence. Wunsy’s efforts were so great that he effectively scared off the attacker, leaving both himself and his owner unharmed. When one thinks of an animal that is going to serve as a protector, a cat is probably one of the last pets to come to mind. Cats are content and snuggly at best, but are often known for their seemingly overwhelming amount of apathy towards humans in general. Felines are incredibly smart, and can be very caring, but there’s a reason we have colloquialisms such as “cat nap.” These cats, however, proved that generalizations don’t always hold up. In 2014, a camera caught footage of Tara, a cat who took on a creature twice her size. When her owner’s son was being attacked by a dog, a video showed her rushing to the boy’s aid, chasing off the dog in the process. Not only did Tara get the dog away from the 4-year-old boy, she ran him off the property as well. Tara’s efforts were recognized by the Los Angeles SPCA, the first time a cat was ever awarded for bravery. Two cats made headlines for waking their owners up in times of danger. In 2007, a black cat by the name of Schnautzie spent one night persistent on waking her owner up. Upon waking up, it was discovered that a deadly gas leak had been taking place throughout the home. A couple who were expecting twins were fast asleep in their Chicago home when their beloved cat named Baby did everything possible to wake them up. The cat alarm worked better than their fire alarm did, because by the time they were up, the house was filled to the brim with smoke. There’s a solid chance Baby was treated to some catnip and a trip to the pet store as a reward. Pets bring us so much joy in our lives, they provide so much comfort and happiness, that sometimes we forget that we can do the same thing for them. If your dog, cat, or even pet bird hasn’t had a chance to showcase their bravery yet, they would still love a trip to Royal Pets Market & Resort. From pet grooming to pet boarding, a veterinary clinic and more, Royal Pets Market & Resort has everything your animal needs. Stop by one of our Florida locations today!